I've had a few enquiries and comments on the frames I choose for my works. 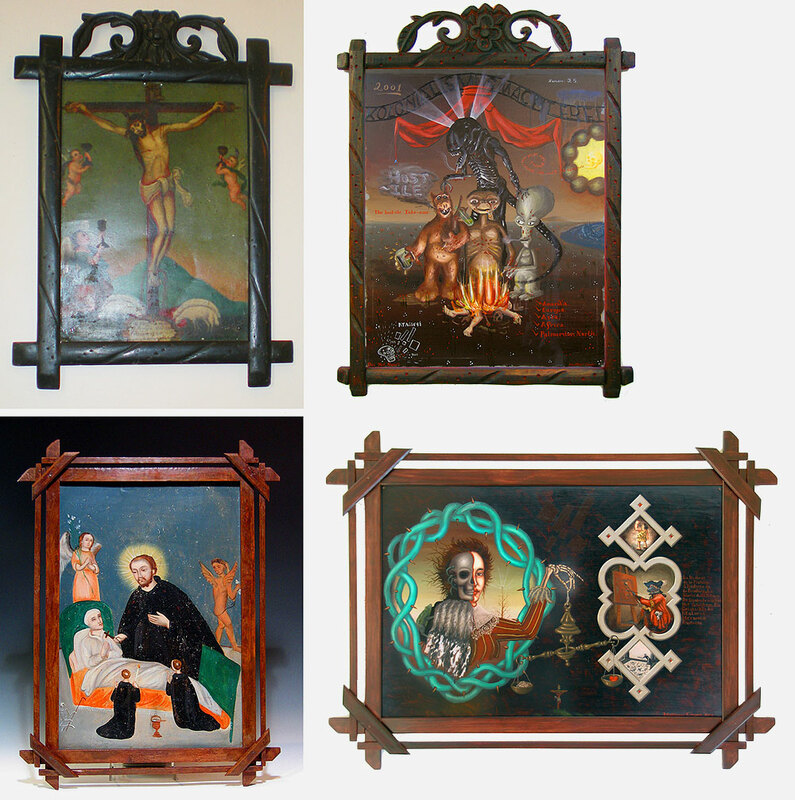 The frames I use are in keeping with the Spanish/Mexican Colonial period and I hand-make them myself. This is so the frame is on the same level as the work. In keeping with tradition, I want the object to be a whole thing, not just a painting with a box around it I paint the painting myself, so I make the frame myself. It was a while before I saw antique hand-made frames from this period, so I've done a bit of research in looking at the difference in design from different periods and locations. With retablo painting, the work was often framed by a nicho - a decorative flat-sided frame made of thin tin with pressed and punched-in designs. I prefer wooden frames as they provide strength to the painting on metal. I source the frame designs from different places. My painting on the top right, presently on exhibition at Paper-Works in Napier, is based on a carved wooden example that frames a stunning 19th Century Crucifixion owned by a friend up in Auckland. The other painting, bottom-right, presently on display at Mark Hutchins Gallery in Wellington, is based on a simple wooden construction framing a San Camilo de Lelis retablo, bottom-left, courtesy of Historia Antiques in Santa Monica, USA.